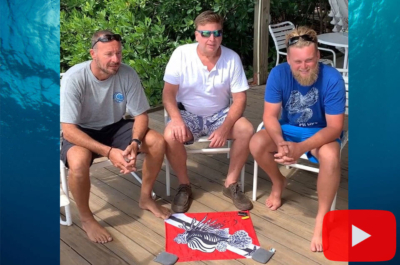 Lionfish Hunting with Norman Arends, of Aruba Scuba Safari, near Rodgers Beach in Aruba. 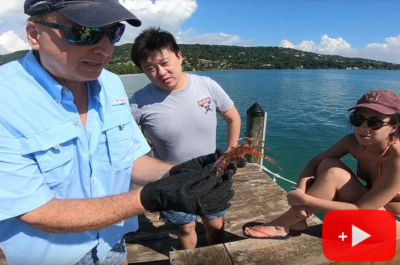 Roger J. Muller, Jr. is helping Aruba and the environment control this invasive species and save the coral reef systems. 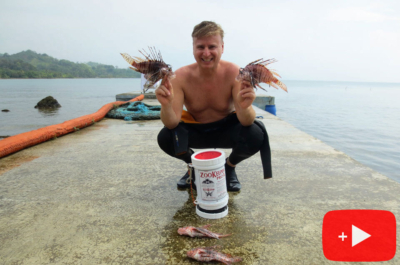 Each dive, we killed approximately 20 lionfish, which is a high amount. 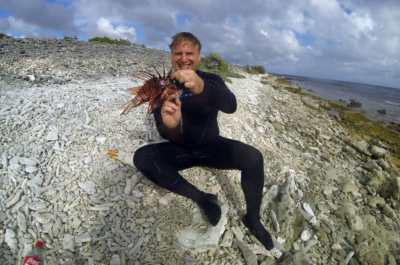 Norman Arends is one of the best lionfish hunters and knows where to find them. The dives were advanced dives, spearing lionfish at depths of 130 feet at times. PADI suggests a maximum of 130 feet on dives for safety reasons. Dive time was around 45 minutes, since we are diving where many shops will not dive. Lionfish hunting equipment used on the dive was the Foldspear and a Zookeeper. The Foldspear neatly folds down to 12 inches and fits into a leg pouch, making getting in and out of the dive boat much safer. You can buy tips with 3 prongs up to 6 prongs. The Zookeeper is a containment device to put the speared lionfish into. 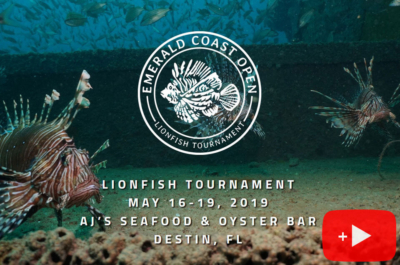 Learn more about safely cleaning and cooking lionfish.